When most Americans hear the word “barbecue,” they think of hamburgers, hot dogs, chicken and steaks. Those are tasty but not the most healthful option. Make your burgers with ground turkey instead of greasy beef. Choose lean cuts of steak and cut large steaks in half. Marinate your chicken with a citrus vinaigrette in lieu of brushing with a sugary BBQ sauce. Try grilling lean turkey breast to use instead of pork for pulled-meat sandwiches. For health’s sake, skip the hot dogs completely. 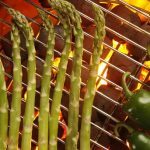 Next time you’re getting ready to barbecue steaks, chicken or burgers, prep some veggies for roasting, too. Skewer slices of colorful bell pepper, whole mushrooms, baby onions and cherry tomatoes and brush with olive oil. Place skewers on the grill, and turn them often. Whole ears of corn can be grilled in the husk. Delight the vegetarians at your barbecue when you oil and grill inch-thick slices of eggplant and whole portobello mushroom caps. You may have heard that barbecuing meat causes certain carcinogens to form. It’s true, but it doesn’t mean you have to give up grilling. Simply clean the grill rack before you cook, and take care not to burn your meats. Use a piece of crumpled aluminum foil to remove any charred bits left on the grill rack from your last BBQ. If any parts of the meat you’re cooking become burnt, cut off the black bits before serving. Use your favorite potato salad recipe, but substitute plain yogurt for the mayonnaise. If you make macaroni salad, use whole grain pasta, and use Greek-style yogurt instead of mayo. Add at least twice as much chopped celery as either recipe calls for, to add crunch and healthful fiber to every bite. Most seafood selections are lower in fat and calories than an equivalent amount of red meat. When you make shish kebab, use shrimp instead of lamb or beef. Thick cuts of swordfish, salmon and yellowtail tuna make gorgeous steaks when lightly oiled and grilled. Wrap packets of clams and mussels in aluminum foil and toss on the grill. Fruit punches are delicious, but they’re also loaded with sugar. Fill your punch bowl with flavorful iced tea, instead. Mint teas are especially refreshing at summertime BBQs. Don’t sweeten the tea, but do offer a basket of single-serving sugar packets. If you plan to serve wine at your BBQ, stock up on club soda. Spritzers made with half wine, half club soda contain half the calories of straight wine beverages. Slice fresh pineapple into one-inch sections and brush with coconut oil. Grilled to perfection, pineapple makes a sweet treat that delivers far fewer calories than traditional barbecue desserts. Halved plums, peaches and apricots grill up nicely, too. For kids who clamor for ice ice cream, home made fruit juice popsicles are a healthier option. Summertime barbecues are fun, but they don’t have to weigh you down. Cook wisely, offer plenty of salad options, and you and your guests can enjoy a flavorful BBQ that’s light and delicious.